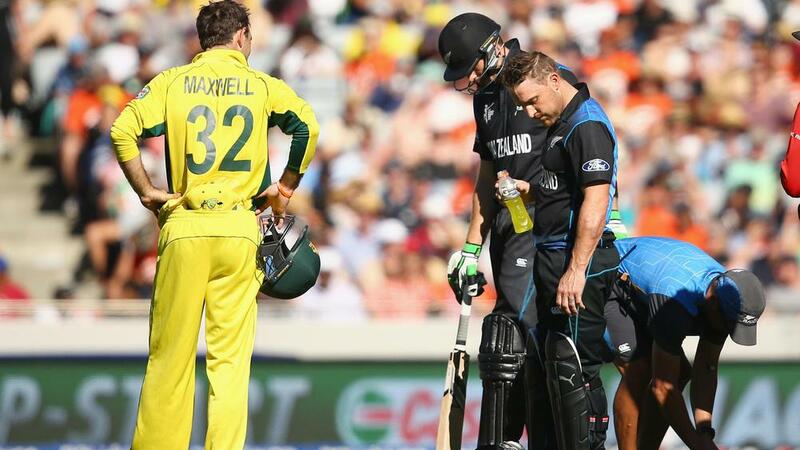 New Zealand captain Brendon McCullum is not expected to miss any cricket after a nasty blow to his forearm. New Zealand coach Mike Hesson expects captain Brendon McCullum to be "fine" after suffering a swollen forearm in the thrilling Cricket World Cup win over Australia. McCullum was struck on the forearm by a Mitchell Johnson ball in Auckland on Saturday, with the injury swelling immediately and requiring a compressive sleeve. The explosive opener made 50 as the Kiwis claimed a nervy one-wicket win in Auckland to maintain their perfect start to the tournament. McCullum is yet to have an x-ray on the injury, but Hesson said it appeared the right-hander would be OK.
"He looks a bit like Popeye," Hesson told media on Sunday. "Other than that he's pretty good. It is pretty swollen, so we'll try and get that down first and make another assessment in a day or so." He added: "All the signs are he'll be fine." McCullum has made 207 runs at an average of 51.75 at the tournament, with New Zealand fielding the same team in all four matches. Hesson is unsure if that will continue as his side prepare to face Afghanistan and Bangladesh in their final two pool games. "When you have a week between games, if you leave out some of your key players, it can be two weeks before they play again, which is a long time," he said. "We'll have to sit down and work out the pros and cons of both, but as we've said all along, all 15 are key players for us, and if they have to perform a role, I'm sure they will."